United Utilities PLC (formally North West Water) provides water and wastewater services to 7 million customers in the North West of England with a total area of more than 14,000 square kilometers. United Utilities operates 192 reservoirs, 453 service reservoirs & water towers, 40,000km of water mains, 1,200km of aqueduct, and 137 water treatment works. Nearly 93 per cent of the total installed capacity in Sri Lanka (both hydro and thermal) is in the hands of the Ceylon Electricity Board (CEB) and only around seven per cent is in the hands of Independent Power Producers. Sri Lanka generates two thirds of its electricity from water, and in 2002, after five years of failed monsoons, major cities were facing 1-4 hour preplanned power cuts due to low water levels. ASMAE is the new entity created in February, 1999 to manage the wholesale energy market (MAE) in Brazil. The Mekong River Commission (MRC) was established on 5 April 1995 by the Agreement on The Cooperation for The Sustainable Development of The Mekong River Basin. The MRC member countries are Cambodia, Lao PDR, Thailand and Viet Nam. MRC maintains regular dialogue with the two upper states of the Mekong River Basin, China and Myanmar. The MRC member countries agree to co-operate in all fields of sustainable development, utilisation, management and conservation of the water and related resources of the Mekong River Basin, such as navigation, flood control, fisheries, agriculture, hydropower and environmental protection. ADB is a multilateral development finance institution dedicated to reducing poverty in Asia and the Pacific. Established in 1966 they now have 63 member countries, 2000 employees, and in 2003 approved loans totalling US$6.1 billion. A list of all the energy related projects supported by the Asian Development Bank can be found here. Itaipu in Brazil is the world's largest power plant of any kind. The plant is located on the Parana River 14 km north of the International Bridge linking Foz do Iguacu, Brazil and Ciudad del Este, Paraguay. Planning for the project started in the 1960s, construction started in January 1975, and the first of eighteen 700-MW turbine/generators went on-line in May 1984. The total direct plant investment is estimated to be $11-bil. In 1997, Itaipu generated a record 89.2 TWh of electricity and provided 79% of Paraguay's total electricity supply and just over a quarter of Brazil's total supply. Itaipu was an immense undertaking. 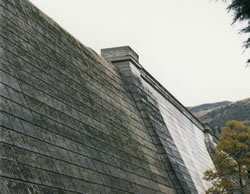 The main dam has a height of 196 m and the construction required 12.6-mil cubic meters of concrete -- 15 times the amount used in the Channel Tunnel -- and 478,000 tons of steel. 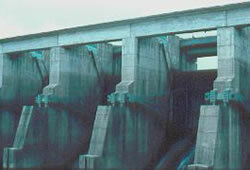 The various dams have a total length of 7,744 m while the water flow through each turbine penstock is equivalent to the normal flow of the Seine River in France. Itaipu was going to be even larger, but plans to add two more 700-MW turbines at a cost of $190-mil were canceled in June 1999. Energy from water (hydro) is a very important source of electric power in Tanzania currently accounting for about 67% of total available installed capacity. Tanzania’s total hydroelectric energy potential is in excess of 4.7GW of installed capacity or about 3.2GW of firm capacity. Of this potential installed capacity only about 5% has actually been developed. London Economics is one of Europe's leading specialist economics consultancies and, since 2000, is part of the Indecon International Economic Consultancy Group. London Economics' head office is in London, and works in partnership with the French firm, Stratorg International, which gives it a global reach. London Economics is committed to providing world-class standards of advice and services to private and public sector clients. The National Rivers Authority was formed in 1989 when the ten British water authorities were sold as water service companies to oversea the management of water resources, including rivers and river water quality, fisheries, leisure and pollution control. The National Rivers Authority was Absorbed into the new Environment Agency. The Environment Agency has responsibility across England and Wales for the protection of the environment. This includes issues relating to agriculture, rivers, air quality, industrial pollution to land air and water, solid waste, flooding, fisheries, nuclear power and water resources. The United Nations development Programme (UNDP) operates amongst many, the Electricity Network Rehabilitation Programme (ENRP) across the North of Iraq. The programme includes major repairs to Northern Iraq's two major dams and associated hydro power stations, as well as a survey of the electrical distribution network and preparation of a maser plan for rehabilitation and expansion. The World Bank Group’s mission is to fight poverty and improve the living standards of people in the developing world. It is a development Bank which provides loans, policy advice, technical assistance and knowledge sharing services to low and middle income countries to reduce poverty. Some of the largest projects that the World Bank has supported include the Ertan hydroelectric project in China, the Ghazi Barotha hydropower project in Pakistan, the Upper Indravati hydro project in India and the Yacyreta hydroelectric project in Argentina. Lahmeyer International provide independent engineering consultancy services covering the fields of energy, hydropower and water resources. ELECTROPERU S.A. runs two hydro-electric plants which make up the Mantaro complex, which has an installed capacity of 1008 MW, and a thermal power plant in the northern department of Tumbes, with an installed capacity of 18 MW. The Mantaro hydro-electric complex is the country's leading electricity generator, covering 37.5% of demand in the National Interconnected Electric System (SEIN), Peru's main power grid, while generating capacity is equivalent to 33% of national electricity demand. The Centre for Ecology & Hydrology (CEH) formally the Institute of Hydrology, aims to advance the science of hydrology through research leading to a better understanding and quantification of the physical, chemical and biological processes comprising the hydrological cycle at local, regional and global scales; to investigate through monitoring and modelling natural changes in the hydrological environment and to assess past, present and future effects of man's impact on all phases of the hydrological cycle; to secure, expand and provide hydrologically relevant data so as to further scientific research and provide a basis for advice to Government and to promote the use of CEH's research and data to enhance the United Kingdom's industrial competitiveness and quality of life and for the benefit of mankind. Updating of existing AQUARIUS models to represent the 2018 Tanzanian generation and transmission system for optimising hourly plant outputs and transmission line flows up to 7 days in advance. Development of 2019 and 2020 models for optimising long-term stored water value operating policies and performing dynamic simulations. Provision of on-site training. Software maintenance and technical support over 3-year period. TA9003 'Integrated Resource Planning with Strategic Environmental Assessment in the Greater Mekong Sub-region (GMS)'. With Vietnam as an example, Program CAPRICORN used to demonstrate the practicality of explicitly considering 'externalities' when mathematically optimising the expansion of integrated generation and transmission power systems. Imposed constraints included: annual emission targets; annual investment limits; Hydrological Condition related hydro energy availabilities; the imposition of strategic demand management measures; alternative demands reflecting the introduction of 'energy efficiency' measures and their associated investment costs. [in association with Ricardo Energy & Environment]. Electricity Generation and Transmission Masterplan for Ethiopia: Evaluation of alternative long-term plans to expand the Ethiopian electricity generation system until 2037 using Program EPSIM. Development of methodology for varying hydro plant capabilities as a function of demand/system configuration 'years', and taking explicit account of seasonal wind, biomass and solar plant availabilities. Training of EEPCO staff in usage of Program EPSIM [World Bank funded study, in association with Parsons Brinckerhoff]. World Bank funded Electricity Generation and Transmission Masterplan for Ethiopia : Training of EEPCO staff in the application and usage of Program AQUARIUS. World Bank funded Electricity Generation and Transmission Masterplan for Ethiopia: Construction of AQUARIUS models of existing and potential electricity generation systems, and estimation of hydro plant capacity and energy availabilities as a function of hydrological condition, for input to expansion planning procedures. [In association with Parsons Brinckerhoff]. Provision of Consultancy Services for Hydro/Thermal Power Dispatch System Upgrade. Actualisation of historic stream flow series, extreme value analysis and enhancement of AQUARIUS models to include multiple electricity demands and associated transmission line networks. Review of current operations planning methods and scope for optimisation in the light of future development options. Replacement of Program SYSIM with Program AQUARIUS, providing enhanced facilities for simulation and optimisation of long-term operating policies. Construction of AQUARIUS models with system configurations and demands expected to pertain in 2009, 2010 and 2011. Software installation and training of TANESCO staff in its usage. Updating of Program SYRAP for simulating and optimising short-term (7 day) operation of TANESCO's hydro-thermal generation system and determination of hourly unit-based production schedules. Software installation and training of TANESCO staff in its usage. Enhancement and actualisation of MOSPA model of the River Dee system, North Wales, for use in EU Habitats Directive studies. Kennedy & Donkin Power Ltd.
National Rivers Authority and North West Water Ltd.